From I-94 in Jackson, take Exit 142 onto US-127 South and drive to the Monroe exit. Turn left (west) onto McDevitt Street and proceed to the first stoplight. Turn left (south) onto Hague Road and continue to Kimmel Road. Turn right (west) onto Kimmel and right again onto South Jackson Road and follow the signs to the site entrance. The Dahlem Environmental Education Center is located within the Fannie Beach Arboretum. Five miles of hiking trails wind through mature forest, brushy old field, prairie, and wetland on this gently rolling site. 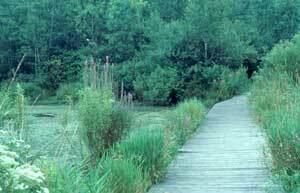 A wooden boardwalk allows hikers to get out into the middle of the wetland. A portion of the trail system is barrier free. In the spring, the trails are great for viewing trilliums and other wildflowers. Nearby Jackson Community College is home of the annual Bluebird Festival held the first weekend in March. This area boasts one of the most successful bluebird management programs in the country–more than 500 young birds are fledged each year! The best time for bluebird viewing is between April 15 and July 31 when adults are busy feeding the young. Bluebirds require cavities for nesting, and they readily use the nest boxes that have been erected throughout this site. A good variety of tree species along the trails makes for excellent fall color hikes. Feeders at the visitor center attract many songbirds and small mammals during winter. Trails – 5 miles of trails. Portions are barrier free. Visitor Center – Open 9:00 a.m. to 5:00 p.m. Tuesday through Friday, 9:00 a.m. to 2:00 p.m. Saturday, and 12:00 p.m. to 5:00 p.m. on Sundays. Cross-country Skiing – On the posted hiking trails. Drinking Water Barrier Free – portions of the trail system.